One of my favorite things about being a designer is the variety of projects. One day your working on corporate branding, the next a retail catalog, and the day after that skateboard. But once you have been with the same company for awhile, the types can start to become repetitive. So when I was given the opportunity to design something that was both new to me and had a huge amount of exposure I jumped at the chance. 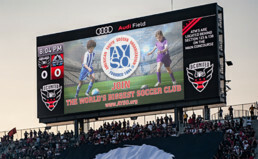 This Jumbotron ad to help player registration will be showing at MLS stadiums across the country. With 24 teams in both the US and Canada, I am super excited to see it up on the screen at games. 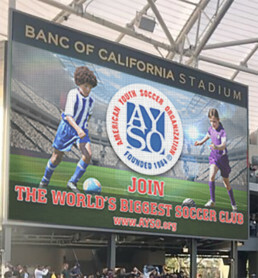 For now I added mock-ups, and am working on a way to get real pictures from multiple stadiums as soon as it goes live.